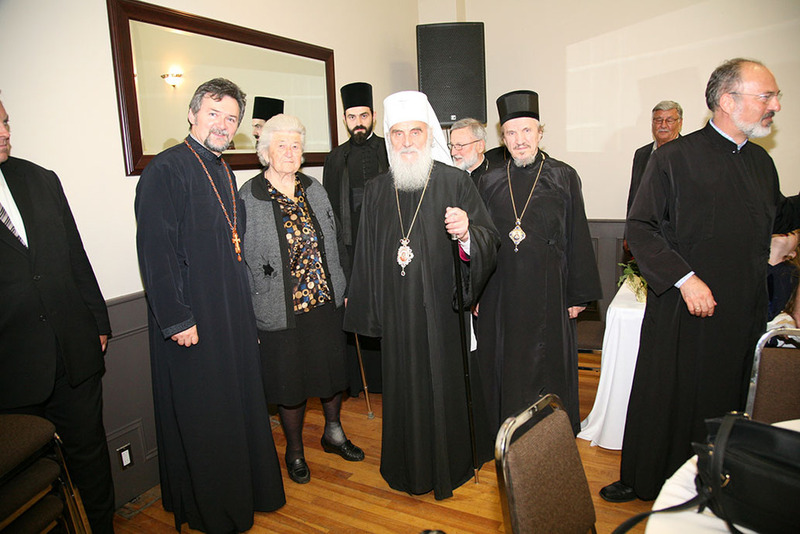 Hamilton, Ontario - His Holiness Serbian Patriarch Irinej, administrator of the Diocese of Canada, visited St. Nicholas Serbian Orthodox Church in Hamilton on Barton Street. St. Nicholas Church is the spiritual nucleus of the oldest Serbian Orthodox parish in east Canada. Serbs began to settle in Hamilton already in 1904. At the initiative of a group of Serbs, mostly from the former Austro-Hungarian empire, a parish was formed in 1913. The parish was founded under the auspices of the Russian Orthodox Church, but it came under the jurisdiction of the Serbian Orthodox Church in 1920. A large number of faithful welcome His Holiness in front of the church. Young Serbs, donned in folklore dress and lined up, made a magnificent-traditional welcome for their hierarch. 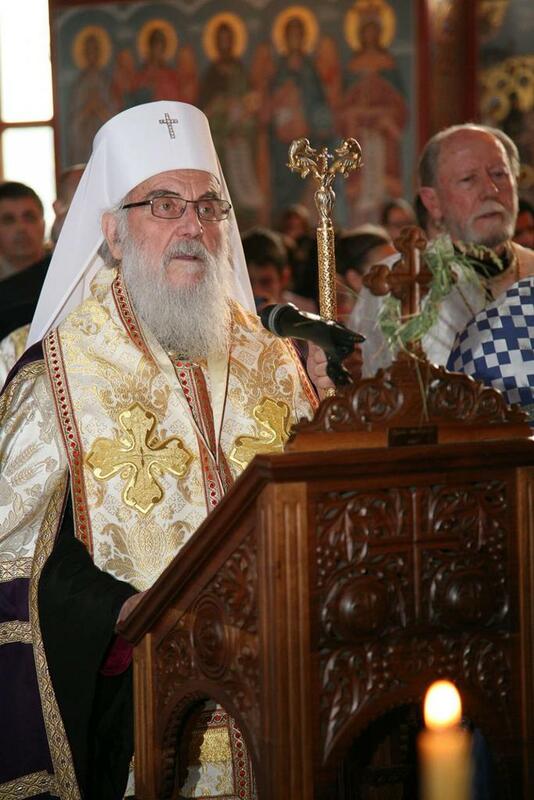 With flowers, bread and salt they welcomed HIs Holiness Serbian Patriarch Irinej. The dean of the church V. Rev. 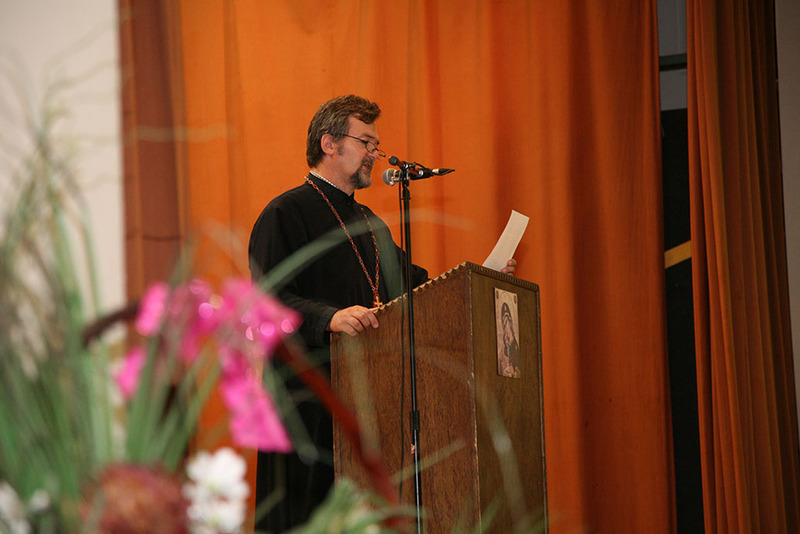 Stavrophor Vojislav Pavlovic, at the entrance of the church, he greeted the Serbian Patriarch. This is the fourth visit of His Holiness to this church. 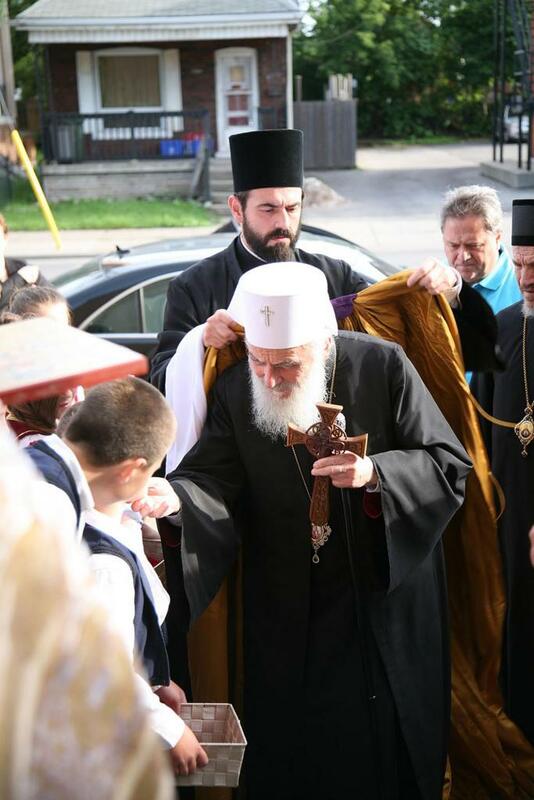 At seven o'oclock the service of the Akathist to the Most Holy Theotokos began with His Holiness Serbian Patriarch Irinej, administrator of the Diocese of Canada, officiating. The church was filled with the faithful who were filled with spiritual joy and happiness. After the service the dean of the church welcomed His Holiness: "Every prayerful meeting with you, Your Holiness, is a special event for the honorable and pious people of Hamilton and surrounding areas. We believe and know that this evening's meeting with you and your blessing will strengthen us more to endure God's way and the path of Orthodoxy on which our people have traveled for centuries. Every era has its own burdens, problems. And this era of our's is burdensome, difficult, where life is always placing new tasks before us. We are confident that this prayerful gathering this evening in Hamilton will be of a great help to us, through God's grace. We believe that we will all be united under the omophorion of St. Sava and your wise leadership. We will hold each other's hands more and believe deeply that God will help us in all troubles that find us. You Holiness, this evening you are in a very good church school congregation. Tonight you are in Hamilton with its good, honorable, peaceful and pious faithful who built two beautiful church who live in unity and love. Allow me to once again warmly greet you and wish you many more years of service to God, for the good of the Serbian Orthodox Church. Many years!" 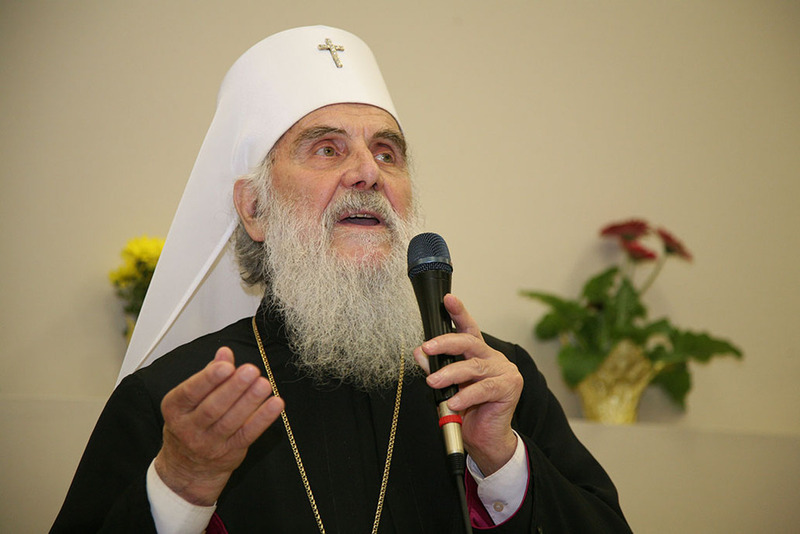 His Holiness Serbian Patriarch Irinej, administrator of the Diocese of Canada, thanked him for the welcome and delivered a homily to the faithful. 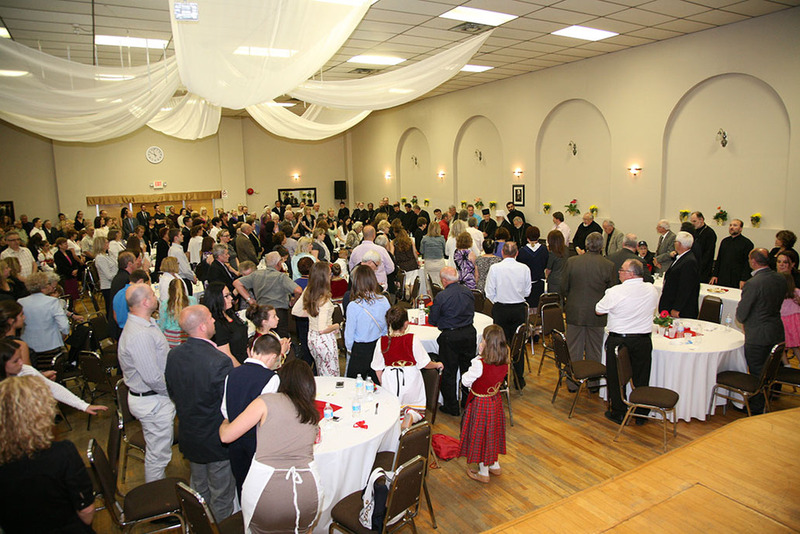 The St. Nicholas church-school congregation in Hamilton celebrated their 100th anniversary in 2013. The beginnings of this parish are connected with the rented house on Sherman Street which was the first place of worship for the Serbs in this city. The first priest was Fr. Georgije Milosavljevic. This house only a temporary solution. Construction of the first church on the corner of Beech and Northcot began in 1917. The Serbian communty in Hamilton became larger before and during World War II. Namely, the city began to develop as an industrial center and Serbs began settling here in large numbers. The new Serbian home was built in 1952 and was blessed by Bishop Dionisije. 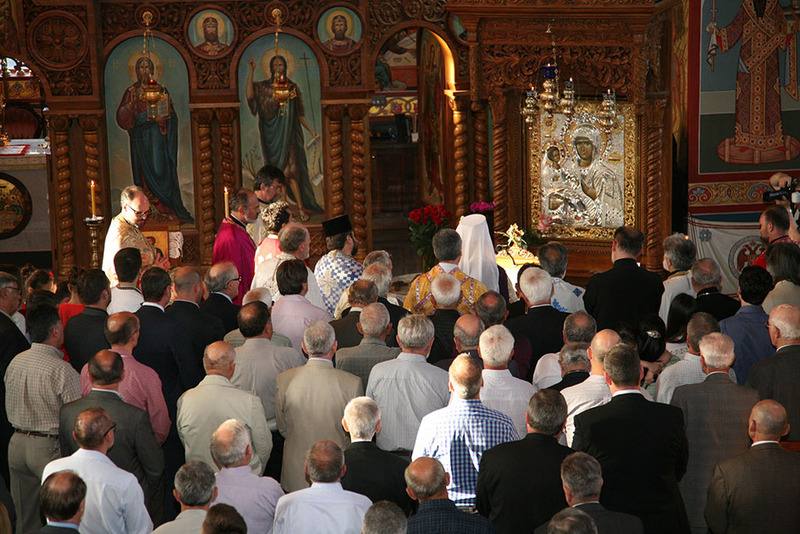 The new church was constructed through the hard work of the honorable Serbs of Hamilton as well as through the dedication of the long time parish priest Prota Djura Vukelich. 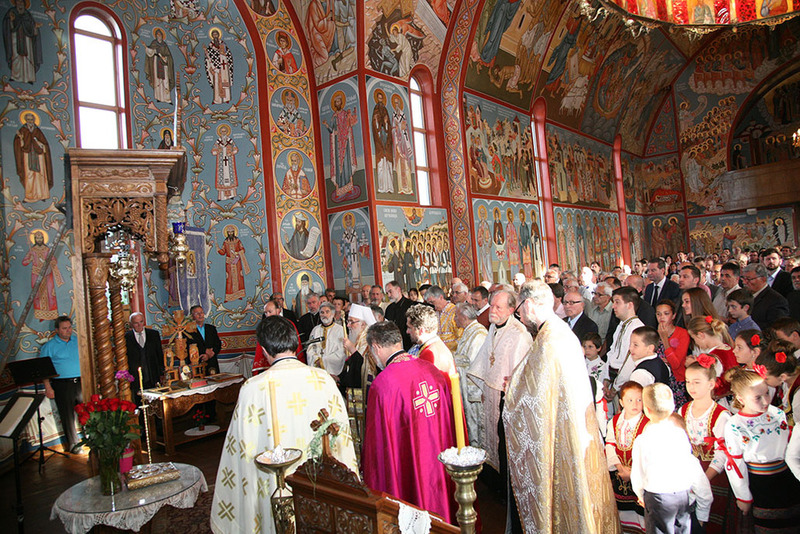 The church was consecrated on September 21, 1975 by Bishop Irinej. The project was completed by architect Radovan Radovic from Toronto. A new era began with the coming of Prota Vojislav Pavlovc in 1995. Fr. Pavlovic continued the work of his predecessor. The roof was completely renovated which allowed work on the frescoes to begin. In only five years the entire church was done in frescoes, done by the well known Russian iconographer Fr. Theodore Jurewicz. 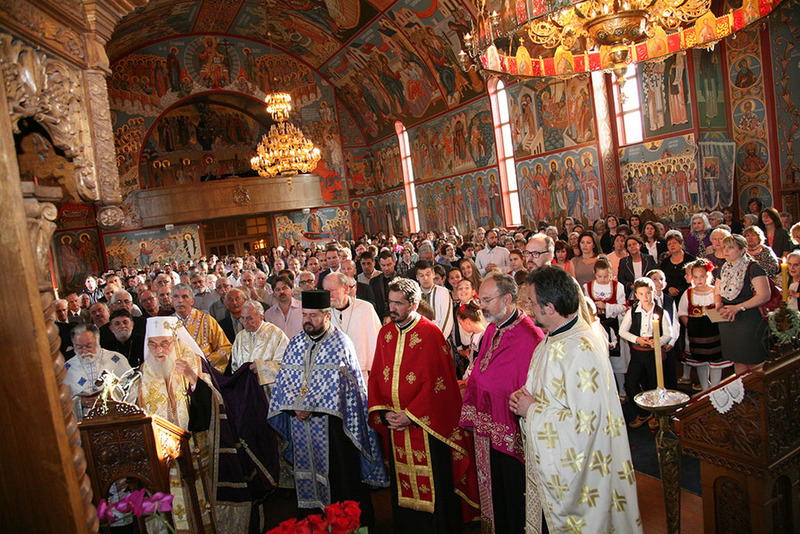 Bishop Longin blessed the frescoes in 2005. 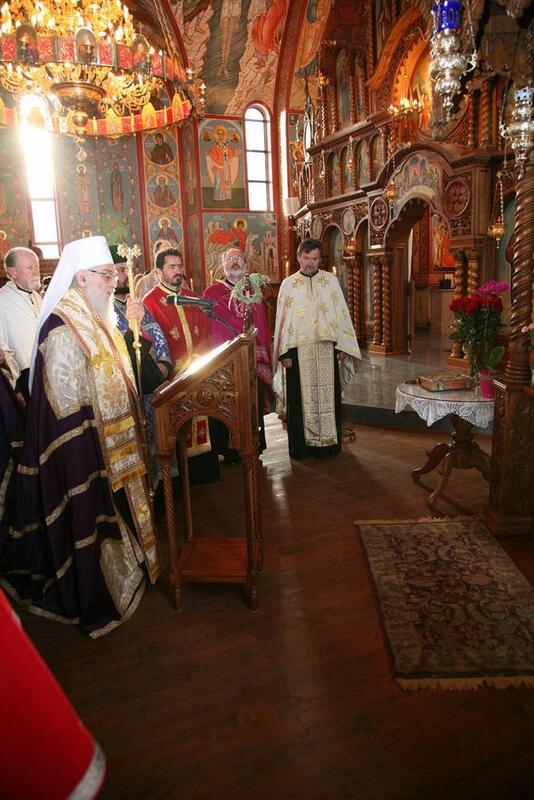 A copy of the Hilandar icon of the Mother of God of Three Hands is in the church. Life in the church is very active. 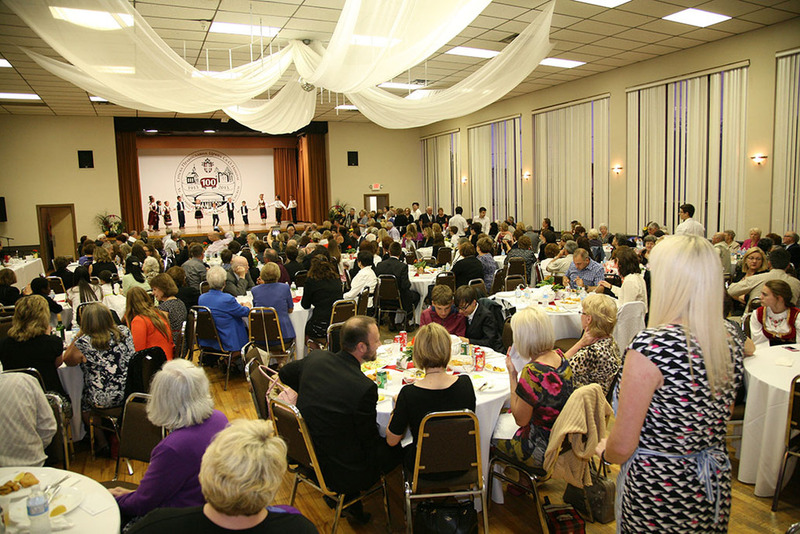 The Circle of Serbian Sisters "Mala Gospojina" have been active in this parish since 1952, the choir "Stevan Mokranjac", Serbian school, and the folklore group "Kolo", founded in 1975. After the service an agape meal was prepared in the church hall. His Holiness was welcomed by nine hundred people, filled with excitement. Fr. Vojislav addressed the faithful once more towards the end of the meal. 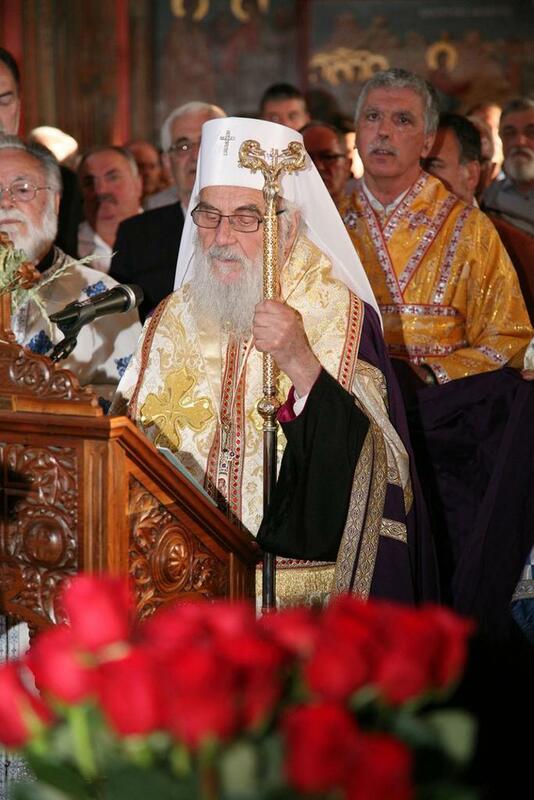 He said, among other things, "....The all merciful God and the good will of our Patriarch has gathered us here at this banquet in honor of His Holiness Serbian Patriarch. 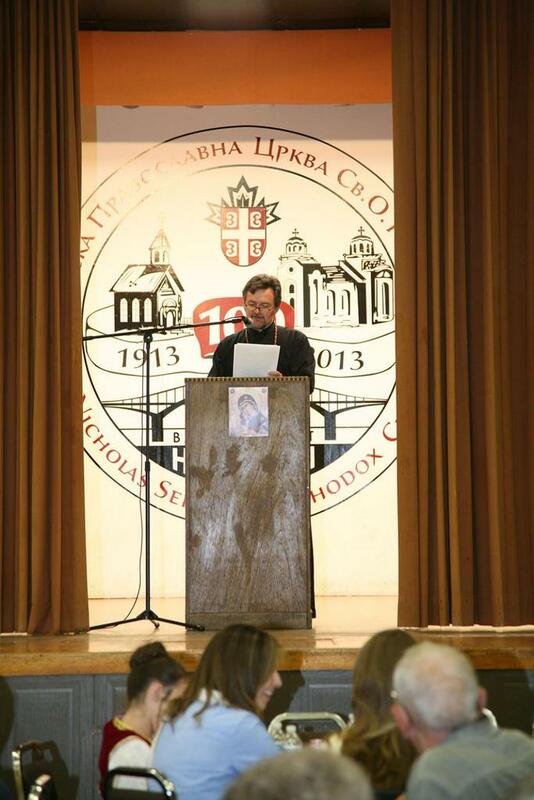 I am given the opportunity and honor to given in short a history of the 100 years of the intensive and fruitful life of this Serbian community in Hamilton. Our ancestors built this church and have kept it through the decades. Here they prayed to God, poured out their troubles and difficulties, before the All-Seeing and His Saints they prayed for help that they continue. Not only that they continue physically but that they preserve their faith of St. Sava, as our ancestors taught us...Holy Bishop. This church school congregation is, so to speak, the first and everything started here. What Pec and Kosovo are for the Serbian people and Serbian church as a whole, that's what Hamilton is for Canada... Good people live here. The people who founded the first church school congregation and later the second. A people who built two beautiul churches, purchased properties. 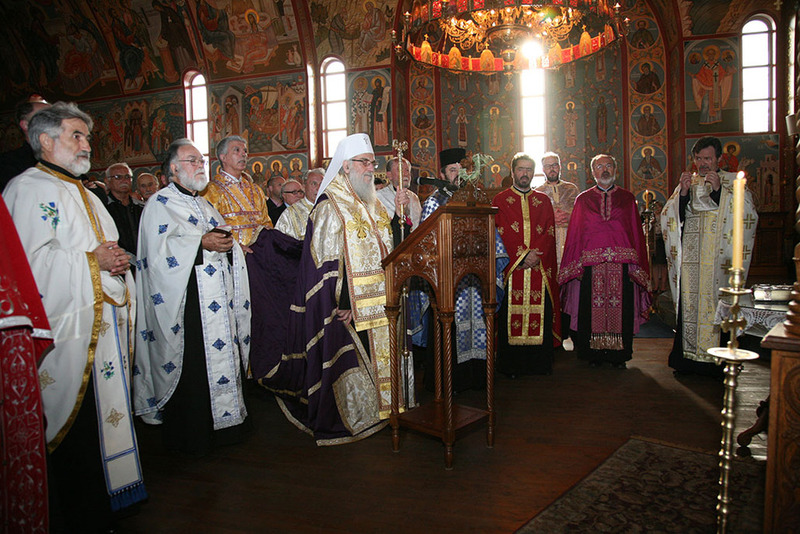 Here we have our Chetnik organization, here Bishop Georgije was enthroned and the Diocese of Canada was founded. This 100 year old parish and this city were and have remained the source of the spiritual, cultural and national life in Canada out of which clear streams later appeared our which generations drank, and God will, will continue to drink. Whether others would like to to admit that or not, but that's how we see it. Only God knows all. 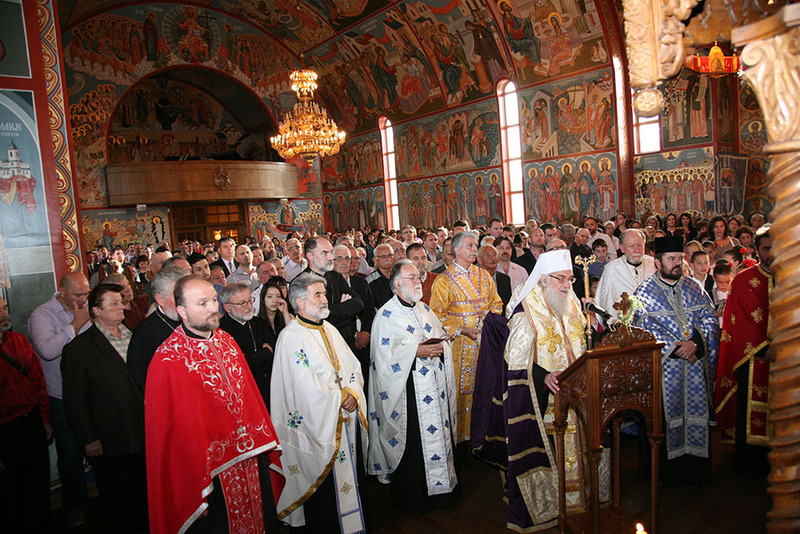 He recognizes all efforts, sacrifices and all the love of individuals, bishops, clergy and lay people, for this zeal towards God and His Orthodox Church. And, thus, in God eternal book everything is written, everything done correctly and righteously. Your Holiness, on the occasion of this beautiful day and meeting offer your blessings on all the donors and benefactors, all founders and establishers, all members in the past, present and future. Bless us and strengthen us that we continue together with you that we work with you for the good of the Serbian Orthodox Church and our people. Bless us, Holy Bishop". His Holiness Serbian Patriarch Irinej blessed all the faithful and addressed everyone, speaking of the importance of keeping our Serbian indentity.